Like the universal languages of music and art, trees speak to us without words, inspiring us to describe them with our own words and visual expressions. In Deuteronomy (Devarim) 20:19-20, we learn that even in wartime is life precious and that trees are essential to our continued existence: “When thou shalt besiege a city a long time, in making war against it to take it, thou shalt not destroy its trees by forcing an axe against them: for thou mayst eat of them, and thou shalt not cut them down; for is the tree of the field a man, that it should be besieged by thee?…” Equally eloquent are the words of the late Lebanese poet Kahlil Gibran in his collection of aphorisms, Sand And Foam: “Trees are poems the Earth writes upon the sky…”. I was reminded of these ideas during our recent observance of Tu B’Shevat (the 15th of the month of Shevat on the Jewish calendar), the minor Jewish holiday that celebrates the renewal of trees (particularly in Israel) and the abundant gifts they provide for us. 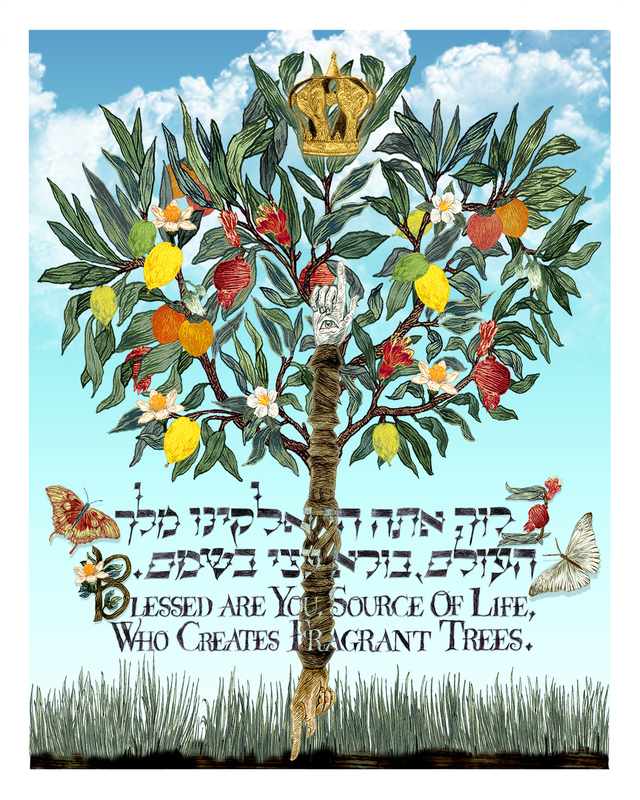 This year on January 16th, as I enjoyed some dates, figs and pomegranate seeds from among the fruit significant to Israel, I decided that I would illustrate the Blessing Of The Trees (Birkat Ha’Ilanot) for my next page in An Illumination Of Blessings. Although trees are spoken of in the blessing for certain fruits, I chose to work with a blessing for trees that also delight our sense of smell with their beautiful fragrance. The tree shown here is an imaginary one that integrates both qualities, bearing several varieties of fragrant fruit and their corresponding flowers. Nesting at the apex of the tree is an ornate golden Torah crown and in place of its trunk is a yad (Torah pointer). Unlike the traditional single-handed instrument used for reading Torah, this one has two hands. Together, these images remind us of our stewardship of this planet. In this, we are partners with the Source of Life Who has given us trees not only for our sustenance but as a model and source for the ‘etz chaim’ or Torah staves that support our ‘Book of Life’, an eternal symbol of Earth’s partnership with Heaven.